NEW YORK, Aug. 1, 2018 — (PRNewswire) — Chemically coated, ceramic implants successfully guided the regrowth of missing bone in lab animals while "steadily dissolving," researchers report. Surgeons and scientists at NYU School of Medicine and NYU College of Dentistry say their implanted scaffolds were naturally absorbed by the test animals' bodies as new bone gradually replaced the devices. The research team describes its progress in a series of reports, the latest of which appears in the Journal of Tissue Engineering and Regenerative Medicine online July 25. Funding support for the study was provided by National Institute of Arthritis, Musculoskeletal and Skin Diseases grant R01 AR068593, and U.S. Department of Defense grant W81XWH-16-1-0772. 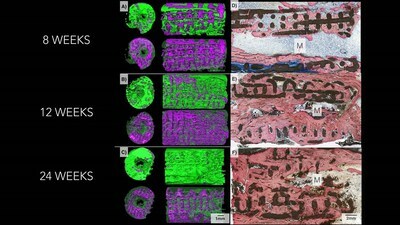 Besides Coelho and Cronstein, other researchers involved in these experiments—and the principal architects of the computer software and the scaffold's design and construction—are study co-investigators Lukasz Witek, PhD, and Nick Tovar, PhD, both from NYU Dentistry, and James Smay, PhD, at Oklahoma State University.